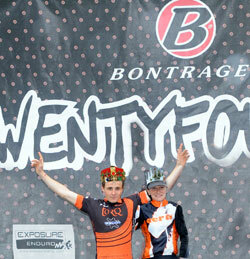 Bontrager Twentyfour12 – TORQ Rules! 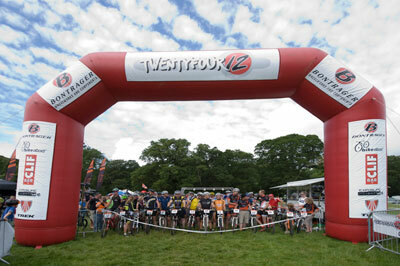 Under the big arch way of endurance happiness ready for the off..
TORQ dominated the transition area as well as the 12 hour race! Representing TORQ honour in the most hardest of disciplines, the solo categories were James Lister, keen to pick up the crown again to add to his two previous wins and Lydia Gould keen to get as much distance as she could between herself and her rivals. Both had tantalising races, with Lister setting his customary hot pace right from the start, leaving the rest of the field in chase mode. Nearest rival Anthony White was also trying to do the double, that is race the 12 hr and then carry on to complete the 24hr hopefully winning both along the way. He hadn’t though factored in the determined Lister who just went out like a cat out of hell, setting a faster pace than most teams, coming home with a massive 17 laps to claim the win. 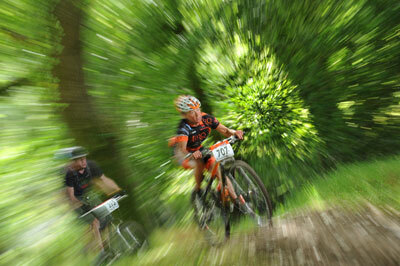 James setting the solo race alight with his blistering speed. Lydia also made her mark early on her strength and determination coming to the front when an incident on one of the descents sent her sprawling, knocking her for 6. Undeterred she picked herself up and dusted herself down (and in the process smeared herself in blood) and carried on unwilling to stop to clean her bloodied face, she carried on to rack up 13 laps, 3 clear of her nearest competitor to make that 2 wins for team TORQ. Lydia flying along for the win, battered and bruised but never gave in. Oh but they weren’t content with just 2, oh no… In the men’s pairs, TORQ rider Stephen James joined forces with triathlete and part time mountain biker Vince Kamp and began a 12 hr battle with AQR (and TORQ loving) pairing of Ian Potter and Warren Miles. In a race that went virtually to the Wire James and Kamp emerged victorious with 18 laps, 1 lap clear of Potter and Miles. Steve handing the baton to team mate Vince. 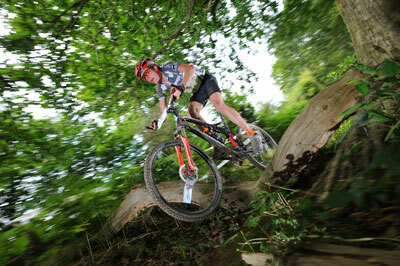 Steve gets stuck in taking advantage of sunny dry trails. A similar tale was being told in the mixed pairs, with Mel Spath and Ryan Sherlock, returning to defend their title from the previous year. Mel not feeling her usual 100% was left struggling to enjoy her time out on the trail but still managed along with team mate and partner Sherlock to take the win. 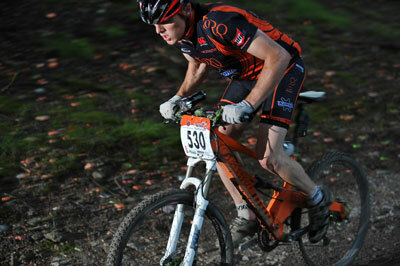 Ryan on his way along with team mate Mel to the win in the mixed 12 hr pairs. 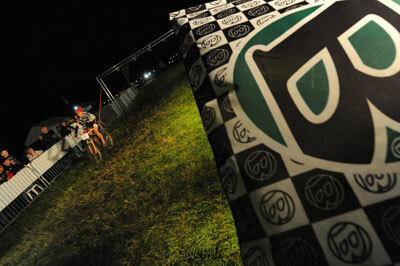 Mel passing the finish line flag, with yet another victory for TORQ. 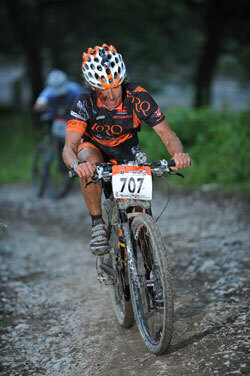 Another battle between TORQ and AQR was on the cards in the mixed team12 hour race. TORQ, fielding team boss Matt Hart, alongside Phil Coad, Rob Rowe and Emma Bradley worked smoothly together to rack up 18 laps leaving their rivals with a deficit of 2 laps – making that win number 5 for the team so far! Matt putting his words into action, any opportunity to get out and race! Emma part of the winning mixed team. Rob another vital ingredient in the winning mixed team formula. Phil Coad, making the final piece of the winning team. Next up were the young guns firing on all cylinders in the open men’s 12 race. Heading this attack on the category was Elite rider Tim Dunford, aided and abetted by Anthony O’Boyle, Ben Thomas and Nick Collins. Despite being pushed all the way by Southfork Racing, TORQ took yet another win with a massive 21 laps, leaving Southfork trailing behind with 19. Just to add the icing on the cake, O’Boyle also clocked up the fastest night lap, meaning another win for TORQ riders as he scooped the king of the night title! Tim making short work of the obstacles on course. Anthony blasting round the course in pursuit of that top spot. Ben helping the winning team rack up the laps. Anthony picking up his crown as ‘King of the Night’ thanks to sponsors Exposure Lights. Making the grand total for wins on the day 6! 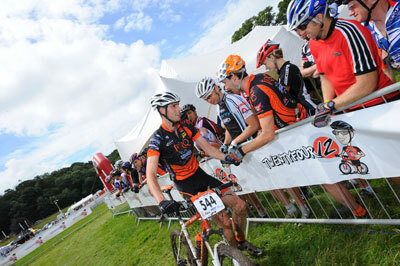 With TORQ winning every category they entered!! Well done everyone and special thanks to Rob Barker the team manager who made sure everything and everyone was running smoothly and made it and even more enjoyable experience for everyone. 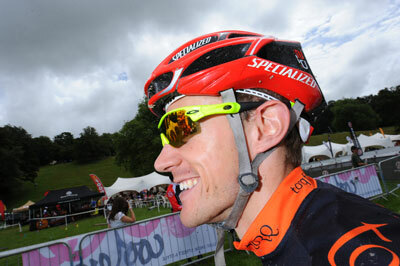 Below you’ll find a couple of first hand reports of the races from a couple of the riders. 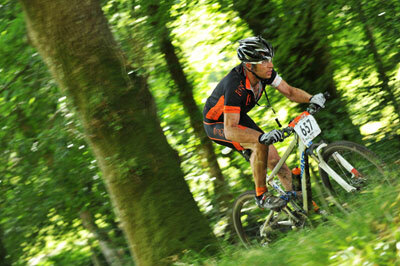 See you in August for the TORQ in your Sleep, for more enduro fun, hopefully with added sun! Matt wondering whether 6 wins was a bit excessive….. 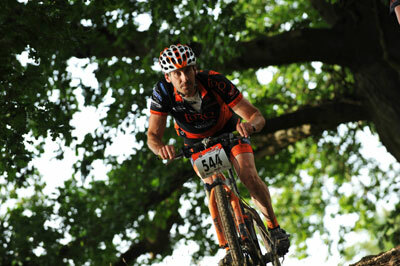 Following the blisteringly hot weekend last year at Twentyfour 12, hopes were high for another dry race. The journey down, however, somewhat dampened our spirits, as a 4 -hour jaunt became a 7-hour trek through torrential storms and constant traffic jams. On arrival, contrary to all expectations, I was very relieved to see that Plymouth had escaped the rain and that the sun was shining. As we rolled into the campsite I could see the Torq Winnebago in the distance. I pulled up alongside it, said hello to the team and set about putting up the tent. After finally getting organised, my first port of call was the registration tent so that I could assess the competition. I was surprised to see Anthony White’s name on both the 12 and 24-hour entry lists and was a little confused to say the least. Confusion aside, I knew that Anthony, Josh Ibbett and Adi Scott were my biggest competition. As the race loomed, the bustle of riders began to congregate on the start line and as always the atmosphere was full of anticipation and excitement. I knew I was up against some very good riders and was keen to get a good start away from the pack. As the gun went off, the pre race nerves lifted and we set off. A quad bike initially led the way and after an additional loop to stretch out the field, I found myself in first place. 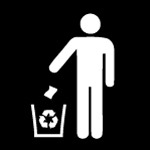 A clean start – if not a little quick. 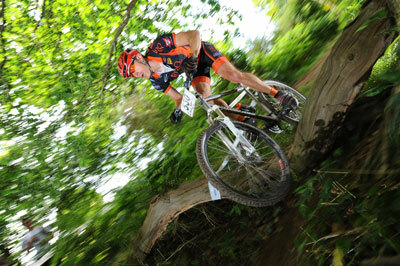 Weaving effortlessly through the trees to take his 3rd win out of 4 in the history of the event. My pre race plan had been to build an early lead and then maintain it throughout the race. I pushed hard for the first few laps spending most of the time riding alone. This allowed me to ride at my own pace and settle down into a rhythm that suited me.  I’ve learnt the hard way at previous endurance events and know that nutrition is as important, if not more important than the actual riding itself. With this in mind I ensured that I was drinking enough, changing bottles regularly and taking on bars and gels accordingly. Everything was going well. I had decided that the bridge over the river was quicker and had been riding it well until my third lap when bang; I caught my bar-end entering the bridge and went straight over the bars – what an idiot I thought to myself. After picking myself up and untangling my bike, I realised I had banged my knees quite badly and scuffed my arm but I wasn’t broken and away I went again. I was sore for half a lap or so and even considered pulling out at one point but the thought of disappointing the team kept me going. The next 4 hours laps seemed to fly by, I was feeling strong and kept things smooth on the climbs. As the halfway point approached, I knew I was having a great ride. As I came round to pit on my ninth lap, I was handed a recovery shake, mmmmm chocolate orange – my favourite. A quick update from my pit crew confirmed that the time gaps to my rivals were gradually increasing. This spurred me on even further and I continued to push hard. To my surprise, about half way into the race, I spotted Josh in front of me. I caught him early into the following lap as he headed up the tarmac climb. We exchanged a few words and I pushed on up the climb knowing that the race had a long way to go and that anything could still happen, but pleased that I had been able to lap him so early on in the race. This gave me a new surge of energy and I pedalled on. The onset of darkness meant that it was time to get my lights fitted, it also meant there were only 4 hours of racing left. I worked it out to be another 6 laps, this seemed a lot better to me at the time than 4 hours. I was told that I was around 22 minutes ahead of Anthony at this point and that I just had to keep a cool head and not make any silly mistakes. At last I came round to the pits for the final time, I was given the reassuring news that all I had to do was complete the lap. 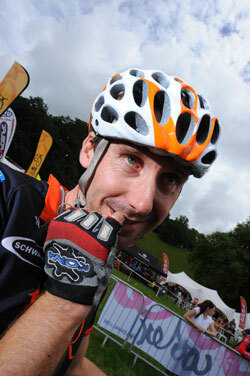 I was tired, but nothing could stop me, half way round the course I lapped Anthony, which was an unbelievable feeling. Twenty minutes later I had crossed the finish line in first place and was greeted by Amy, my girlfriend and Rob Barker, the team manager. All in all it was a great event, a great course and a great weekend. See you all again next year. 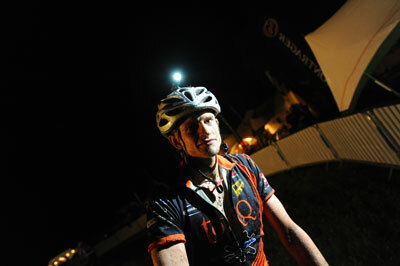 James at the end of a very fast and successful 12 hours. 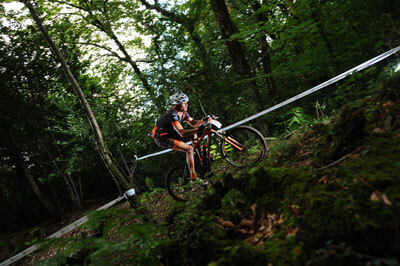 This race was the one I’d peaked for, the adrenalin was up, the tubeless were still up and we were off to a fast start. After the 1st climb my heartrate was off the scale, and the sun beat down on our backs. 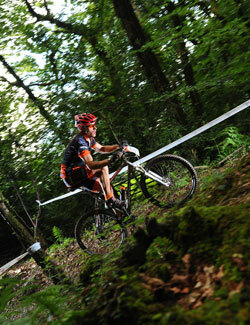 This is a favourite course with a mix of open stretches and technical sections. 4 hours into the race, I knew I’d set off too fast, but I had a lap lead and plenty left in the tank…till I hit the rock. Down I went with bike on top of me. I was furious but refrained from swearing, as I heard the screaming brakes of a rider coming. I saw my race ending, limping home on a broken bike, blood everywhere and a smashed knee, and head. 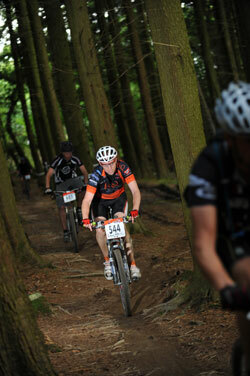 But we were in one piece and wobbled down the `best bit of singletrack to face the clif climb. 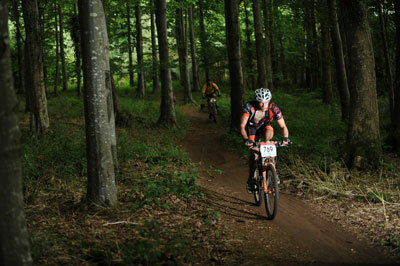 Soon I was back into it, and as darkness fell my new USE lights light up the trail and I was enjoying the night. A TORQ caffeinated gel set me off on my last lap, and on the way home I got off at the `disco in the woods and danced to the music. 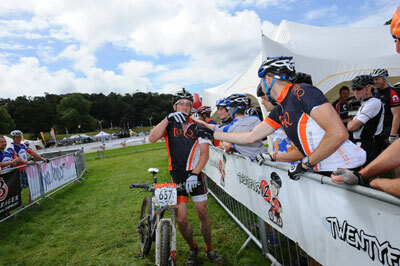 The race was over, I was sore, but happy, and the TORQ Team and a beer were awaiting me at the finish! Thanks to all those whose help made it all worth it! 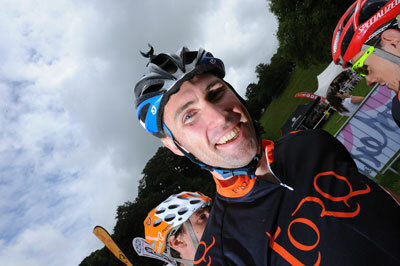 Matt, Rob and family, Rory, all the TORQ riders and all the people out there who cheered me on! Lydia goes into overdrive on that quest for the win. Lydia climbing strongly despite looking very battered. 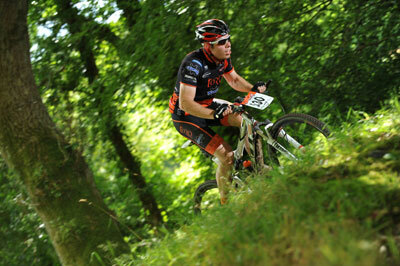 24/12 was my first enduro style event for a while and I was well motivated for it. Saturday dawned bright with the sun making a welcome appearance. A quick practice lap with my team mate Anthony O’Boyle revealed a slightly soggy course but very high on the fun factor with the Bomb holes, Bluebell Woods and the twisty descent my particular highlights. Ben was “volunteered” into starting and did a tremendous job coming round in first place. Determined not to let the team down and to establish an early lead I set off at a furious pace, ignoring my own advice of riding the road climb steady! A couple of good laps and we had a nice gap, but some “healthy” competition between team mates meant we pushed each other on. By mid afternoon the course had dried nicely and was riding superbly. As dusk approached we were issued with our Exposure lights, boy were they bright. The potential of winning a set gave some added motivation to set a fast night lap. The night lap was awesome fun, and the sight of a constant steam of lights coming into the arena was a fantastic sight. As midnight approached we had a fairly comfortable lead but with a few minutes to go Nick tore into the arena leaving poor Ben to start his 6th lap much to the amusement of his team mates. So while he valiantly rode on we did the supportive thing and cracked open the beers! To be honest I was a bit disappointed at only doing 1 night lap, it was that much fun. Maybe 24 hours next time? Overall, a great event. 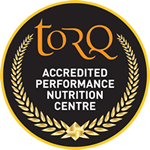 A big thanks to my team mates at Torq for spurring me on, to Matt for the endless supply of Torq food and Rob for ensuring a slick, well run operation. Also a massive thanks to the other riders for moving over, even when I couldn’t decide between left and right. Finally, a massive thanks to the organisers and the marshals for such a well organised event! 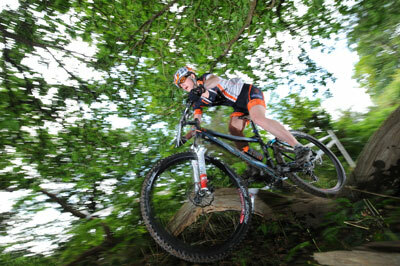 Tim looking forward to his first enduro for a while . Obviously enjoying the challenges along the way .